I seem unable to keep my blog updated for less than a few weeks interval! Here's what I have been doing since the last post. 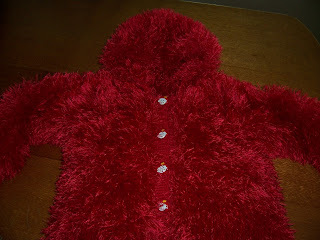 This little Red Sweater with a Hood is identical to one I made a year ago (Red Riding Hood) for a friend's little girl who celebrated her first birthday on Valentine's Day! Now this one is for Vanessa's little darling Olivia, who turned two on Feb 12. Happy birthday darling! Being a little short of the readies, I couldn't post it to you in Ohio until 13th, but I know you will forgive your Aussie Grandma! Ness, if you see this, I would love a pic of Olivia wearing this if you can get one?? Next we have the same little square jacket and hat pattern again - this time in Twilleys Bobtail in cream, with Moda Vera Jazz in stripes of Coffe and Chocolate. The buttons are little flowers made of wood. I think they are hand carved by the look of them. I have no idea where I got them from either, probably in a job lot somewhere, or more than likely off some child's garment bought in an op-shop, just for the buttons. I finally finished a little summer sleevess jacket and sunhat (yep the same square pattern!) 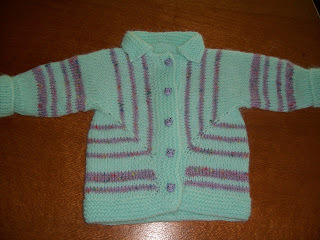 for dear friend Ferda in Turkey,who is expecting a little boy, Adem Ali, in March ! 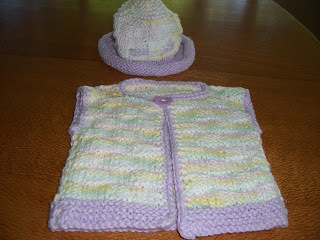 I didn't think the lavender, yellow, white and green was too girlie for him to wear when he is about 3 months old, do you? The button is a lavender heart to wish him love. This and a couple of other little things for when he is first born will be winging their way to him next week Ferda, I know you can't wait!! I wish I knew why postage has to be so exorbitant to overseas from Australia. But according to my local post office, it is much more expensive from USA and UK to Australia - but why? It's not as if there are less planes going to and fro nowadays, more than ever before, so why is it so dear? At last! 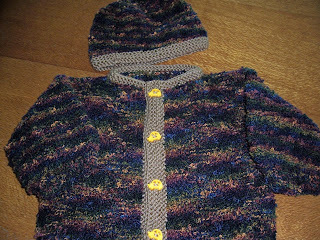 I finished the Stockinette/Stocking Stitch version of the Baby Surprise Jacket started in January with the KAL on knitbabysurprise group on Yahooo. 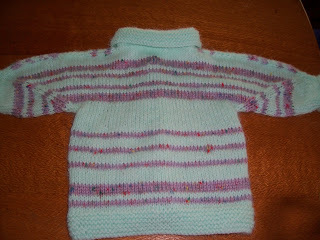 I sewed the seams as a normal sweater this time - with the garter stitch version I usually crochet them on the outside. This was interesting to do - took a bit more concentration as the decreasing and increasing was done on 3 out of 4 rows, not every 2nd row like on the garter stitch one. I did a ribbed cuff, but a garter stitch collar and bands which looks a bit weird to me now - I tried a ribbed band however and it looked godawful. Maybe I should have done a garter stitch cuff instead. The back view is intersting . Next time I shall not use such a fluffy yarn. This was Panda Angoretta in Mint Green, with stripes of Cleckheaton Fleur in lavender with colour flecks, which are nubbly little lumps of colour actually, hence what looks like uneven stitching on the back! 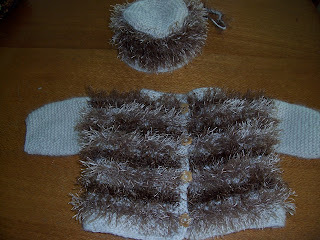 Left is another Baby Albert, knitted in Spotlight Baby 4 ply on 2.75 mm needles. The bootie socks I invented, and I have written the pattern out - so I will post them on here soon. 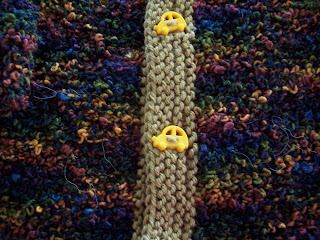 This yarn is weird to knit with - so limp and floppy - that's why I had to go down to such a small size needle. It splits a bit too - so don't think I shall use it again. Very soft though, ideal for super little seamless knits for a preemie and being acrylic, very good for hospital laundries! On the needles a chunky little knitted blanket with a scalloped edge, another Baby Albert, and a lot of donated baby things, half finished, with no patterns, that I agreed to "do something with" that have been sitting in my UFO basket, gloating! Next time! and your creations. Thank you for sharing them with us. 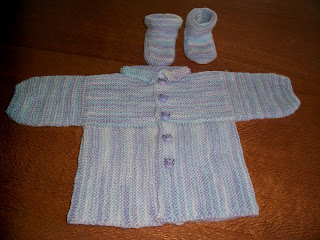 Hi Yvette, your knitting is adorable.I must do the bsjstocking stitch myself, just to see what it is like.I like the ribbed cuffs better than the garter stitch ones.Please can you write down your pattern for the little jacket as it is adorable. What a great job on the baby sweaters. I will be looking for the pattern when you get it written up. Love the choice of colors you used. I have you bookmarked, so I will be back to visit. I am an advanced/beg knitter and am in awe of those who can whip up these patterns! Dusty, a new fan. Love all you creations. Looking forward to visiting your blog more often. what beautiful things¡¡¡¡you have "manos de monja"how we say in our country.because your works are very very greats¡¡¡.kisses for you from Chile. I love the stockinette version of the BSJ. Very creative. I'm kicking myself that I didn't buy more of that Spotty Baby 4 ply while it was available ... so soft to work with - you might remember the Heather set I made in that same colourway last year Yvette. You never cease to amaze and impress me! You are SO darn talented! Where do you get the energy to create such lovely, lovely knits??? ?